I know quite a few people who proudly declare themselves to be full-time bloggers, but what that actually means in practical terms depends on who you ask. Also, very few of us can really use that title. Most of us who work on our blogs full-time also have part-time gigs to help keep the cash-flow going, especially in the first few years. Although I’ve been blogging for over 4 years, I didn’t really devote myself to blogging as a full-time pursuit until about four months ago. Prior to that I worked as an editor for another major blog. It was an amazing opportunity, and it allowed me to write about things other than makeup and outfits. 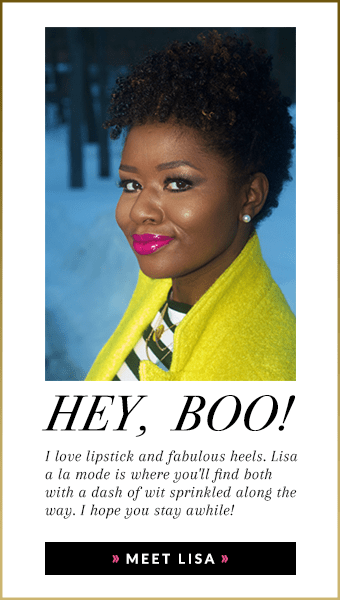 While Lisa a La Mode is my blog, I didn’t think I was allowed to blog about anything other than beauty. By switching over to include any and every topic that interests me, I’ve grown the site traffic here from around 30,000 views a month to over 400,000 views a month. Similar Yellow V Neck Sweater HERE| Similar Shoes HERE| Similar Jeans HERE|Similar Glasses HERE| Similar Bag HERE|Chokers HERE and HERE. Okay, so let’s get to the good stuff, shall we? As you can see, in the last few months, I’ve added quite a few more ads to this site. I know it looks a little crazy right now, but I am working on changing the layout so the blog looks and feels better, even with ads running. In the meantime, the ads have to stay put because they’re how I keep the lights on. #notkidding. The more views I have to the site on any given day, the more money I make. When I post about particular products, oftentimes those links are affiliate links. If you buy what I suggest, I get a small percentage of that revenue. It’s not much, but every dollar counts. My favorite, of course, is Amazon. Most people have Amazon prime so it makes it easy to recommend products to be purchased from Amazon. Brands pay to have their products advertised in dedicated blog posts. This can be pretty hard to do as, traditionally, folks don’t like what feels like direct advertisement. Back before my blogging days, bloggers didn’t have to disclose that they were being paid to review or mention a product, so folks would be more apt to buy because it felt more organic. Now that bloggers do have to disclose due to FCC regulations, it’s a harder sell. Also, many brands want to have complete control over how their product is presented in a post. This becomes problematic because when the brands are too involved, the post is more “ad-like” and therefore less likely to gain the traction the brand would like. I generally get these sponsored post opportunities through agencies or networks created to facilitate relationships between bloggers and brands. Many brands want to have an increased local presence so they will pay influencers to host events on their behalf. They operate the same way posts do, but I charge more for video due to the amount of time involved in creating video content. I sell banner ads on the right hand side of my blog for small business owners who can’t afford to pay for a blog post or a video, but want to cash in on some of my site traffic. I barely advertise my services these days because 99.9% of the people who contact me about consulting want to know what I know for free or over coffee. I’m a wife and a mother and I don’t have that kind of free time anymore. In 2017, I’m leaving 2 slots open for ongoing consulting, but consulting is a viable revenue option for bloggers who want to go that route. I freelance write and and manage the social media for a small local business. Until I can get a grasp on my site traffic, it’s a nice steady bit of income. Similar Yellow V Neck Sweater HERE| Similar Shoes HERE| Similar Jeans HERE|Similar Glasses HERE| Similar Bag HERE |Chokers HERE and HERE. Essentially, you are your own boss. You make your own hours, and you really don’t have to answer to anyone but yourself. Today, for example, my three-year old needed some attention so I was able to stop whatever I was doing to read a story, and then partake in an epic dance-off. We completed the affair with some Christmas candy. You aren’t dealing with the politics of corporate america, where 9 times out of 10 your manager is a complete moron who is in their position not based on merit, but upon their ability to rub elbows with the right people. The harder you work and the more time you put into this, the more money you will make. That isn’t always true when you work for the man. In fact, it was never true for me. You get a ton of free stuff. I mean, you have to work for it, but it’s a nice perk. Since I’m new to the scene of reporting trending topics and pop culture, I essentially have to be online all day, everyday. I recently added a small team of contributors (yay), but since I can’t pay them just yet, I have to take what they can give me when they can give it. The plan is to have a team of writers I can pay by June of 2017, but for now, I’m responsible for catching the latest tea. I work 12 hours a day, 7 days a week. Many brands don’t truly understand the work and time it takes to create posts on their behalf. Many brands are so accustomed to the vast number of hobby bloggers/vloggers who create content for free that they are surprised when full-time content creators attempt to negotiate a higher rate. For instance, I created several videos for a brand at a seriously discounted rate in 2016. They recently contacted me about continuing our partnership into the new year at a more steady and frequent pace. But get this, they wanted to do so by reducing my per video rate. It became clear that that the person making the proposal really didn’t understand what I do and how I do it. Creating a tutorial is a two-day process that can take, in total, 18+ hours to complete. When I create content, I take on the role of model, hair stylist, makeup artist, photographer, videographer, and marketer. If it’s to be done well, it can’t be rushed. I broke down the per-hour rate I’d receive for doing a video at the proposed rate and it was far below the federal minimum-wage limit. I’m a professional, and after almost 5 years, I’m still having to wade through proposals anyone with an ounce of self-respect would reject. This is not to say I don’t appreciate the opportunity, but after working and establishing myself with a brand, it’s disappointing that their response to my dedication and hard work is to undervalue what I do. More brands need to invest in hiring influencers as consultants so they can effectively partner with us. You’re fighting to be seen in a world where influencers are a dime a dozen. Everyone and their mama has a blog, so it’s hard to establish yourself as the real-deal with a real work ethic, when you’re surrounded by people who do it for fun. No shade to those having fun, but I’m trying to eat. Yup. That’s why steady brand partnerships is so important that way you’re steadily getting payments. Otherwise you’re waiting 2-3 months to get paid. I don’t know about you, but my bills have to be paid every 30 days, so waiting 60 days can be nerve-wracking. In Q-4 advertisers pay top-dollar for ad space so bloggers will generally see way more ad revenue during that time. After the holidays, that amount diminishes considerably. For me this means I’ll have to bring in almost double the site traffic to get the revenue I was getting in Q4. What does this mean in plan English? I’ll be on #teamnosleep for the first few months of 2017. Money, man, money. Until you truly establish yourself and are selling your own products, you will be grinding forever. I intended to launch my own product this year, but with the blog picking up so much steam I’m going to push it off until 2018. So the cash isn’t always flowing quite as nicely as some would think, and many of us do without to keep the dream alive. For me that means no vacations, and not a ton of leisurely time. It also means budgeting, and routinely keeping an eye out for gigs that pay steadily. So there you have it, the good, the bad, and the ugly. If you like this post, read about how I started HERE, and for more tips about my life as an entrepreneur read this post HERE. Thanks for sharing ! This is my first year blogging and this post gives the real and no sugar coating. What’s your fee and details on the process. Being an entrepreneur is definitely not for the faint at heart. It takes time, dedication, and a willingness to be bend aka take up a side gig or two. Thanks for the advice and honesty. I’m just starting to get back into blogging/vlogging and your shared experience has given me a lot of insight. It may be hard but I’m willing to grind it out than the alternative–continue to work for someone else forever. Thank you for your honesty and transparency! I appreciate you lots! Thank you for your great content! This is great info very useful thank u for the truth its very hard to find. Thank you for sharing. This post was very informative and as a new blogger, I was able to take away a lot of gems to help me in the long run!! This was a really inspiring read, thank you for sharing! WOW! Thanks so much for the transparency! Your post has been the most authentic I’ve read in some time. As a new blogger, this is what I needed to read so that I’m aware of the ups & downs. This article is really great for somebody who wants or is in the blogging business. am a blogger though I haven’t reach the corprate. I appreciate your transparency on your blog and this post. I really don’t mean to sound like a ditz, but ma’am, your look on this post is a mood that I need in my life right now! You look so damn good!